This entry was posted in Home-Made Pastas, Make It Yourself, Misc, Pasta/Rice/Soups (Primi Piatti), Vegetarian and tagged Food, Italian, Pasta, Recipes by ChgoJohn. Bookmark the permalink. Asparagus? LOVE! Mushrooms? LOVE! Ricotta? LOVE!!! I think you have a real winner here John. Who cares if it’s another ravioli filling recipe? Looks delicious! Thanks, Anne. I’ve been on an asparagus binge lately and making ravioli with them seemed like such a natural thing to do. They were certainly well-received by my friends. P.S. Being the good Mexican that I am, I briefly thought of tacos of some kind…there, now you can go over the edge without a second thought. Thanks, Angeline, but I seriously doubt that ravioli making is beyond you. It is much easier than you think or else I couldn’t do it. Your lasagna roll-ups sound much like our cannelloni. No matter what you call them, I bet this filling would be great in it. Came back on to work and ended up in Chicago:) ! I love your earlier timed posts John! I find this very interesting and shall try soonest. I can’t get crimini mushrooms here; thanks for the photo – they look similar to our Swiss Browns. I love, love, love asparagus, but have never cut fresh asparagus to pieces: so there is a ‘first’ coming up there! I usually buy ricotta readymade because of lack of time: thank you for the draining tip. Do not have a machine or attachment but I like rather thin-skin ravioli, so just as well 🙂 ! As a matter of fact may buy a couple of more packets of won ton wrappers and use those firts and foremost. John this looks gorgeous and is perfectly timed for me as I quite literally bought a food processor TODAY! My trusty stick blender has served me well over the years but I’m really looking forward to cranking up the processor and trying a few of your ravioli fillings. The crimini mushrooms will necessitate a trip to the market but it’s always good to have an excuse. Your market looks lovely with all its Summery treats. Ours is filled with root veggies at the moment! Thank you, Saskia, and congratulations on the new arrival!!!! You’ll love having a food processor. They are so easy to use and you can do so many things with one. Mine broke down over the holidays in 2011 and I didn’t know what to do! Our markets are just starting to show some variety. Summer is here! 00 flour, so glad you found a source. It is actually not too difficult to get here in LA and it does make all the difference. Duck eggs though… I’ve never even seen one before but I’m curious now! I want duck eggs on toast now 🙂 Your ravioli are simply beautifully made, I can’t believe how perfect they look. The ravioli look wonderful! I would love to try duck eggs and see if they have a different flavor. I’ve enjoyed the eggs of the common quail in the past and they are really quite good, but I would just eat them plain to savor them. I fried 2 duck eggs and served them atop grilled asparagus. THey tasted a bit more rich than chicken eggs. But you’re right. You have to eat them plain to really detect any difference. My palate is no where discriminating enough to detect any difference when they’re used in pasta dough. I can now get quail eggs and will once I think of a use for them. I’m so excited for this! Asparagus is in season here too. And by the by, Giada de Laurentiis and Mario Batali got nothing on you! Asparagus season is the best! What a great way to begin the growing season, with these delicious spears. That’s quite a compliment you paid me. Thank you. Love this filling. Few and readily available ingredients plus one could probably swap other in season vegs for the asparagus. Your cooking instructions are clear and concise, very easy to comprehend and follow. I will most likely use store bought wonton wrappers instead of making my own ravioli dough (one of these fine days I will, promise). Appears you have a wonderfully well stocked farmers’ market, how lucky. Yes, the Evanston farmers market is the best one in this area that I have found, especially since it has free parking. In the City, that means a lot! Ooh this one looks good and I can get all the ingredients easily here. Was interested to work out from the photo that what you call Crimini Mushrooms are what we call Chestnut Miushrooms – yay, now I know what they are! Am going ot send this post to my mum as she has just bought a ravioli maker attachment for her pasta machine…. Thank you, Tanya. This is another simple filling but it’s big on asparagus flavor. I have a ravioli attachment for my pasta machine, too. (Yes, I can make ravioli any number of ways.) Your Mum will probably need to use thicker dough sheets than she would if she were making ravioli by hand, just like with the attachment for my KitchenAid stand mixer. To be sure, you can search the web, asking “how to make ravioli using” her pasta machine’s name. I bet you’ll find videos of people using it. They will be much more honest and tell you exactly how thick to roll the dough sheets. They were a help to me. Good luck! Very Passion Man,original creative filling,a lot work…but a great tasty!John thank you you sharing all of it! Thank you, Massi. You’re always so complimentary and I appreciate your kindness. LOL! Thanks, Sally. You’re too much! Such a delicious combination! One day I am going to grow the balls to make my own pasta! 10 kinds? I haven’t space for these 6. Wherever would I put 4 more? Before I bought the KA attachment, I bought one that attached to my pasta machine. I didn’t like that one at all. I bought the KA thinking it would work better being it was KA. Well, it was more expensive but that’s about it. Mom was right all along. The molds work best if you’re stocking the freezer. Once you get a little experience, you can make a few hundred in a couple hours. This is quite a community isn’t it? I’m amazed every time I learn that one of our family recipes is being followed by someone across the world. Wow! Just when I think ravioli can’t get any better, you and share this recipe! What a wonderful filling John! John, my taste buds are jumping up and down with excitement at the thought of this fabulous filling – scrumptious! Duck eggs, okay, guess I need to get me some duck eggs then. Sounds strange but for some odd reason my brain hasn’t quite liked the idea of eating duck eggs – couldn’t tell you why though! What lovely ravioli! When you mentioned ramp season being over, I immediately thought of garlic scapes, but I see you have that covered! When I have a lot of basil, I’ll make pesto with some for immediate use. If I’ve got enough to freeze, I’ll make pesto but omit the cheese and cut back on the oil. I find the cheese doesn’t thaw easily and causes the pesto to clump. When I want to use it, I toss the pasta with some oil before adding the pesto and then add the cheese that I had omitted before freezing. You can, also, put the leaves in a food processor with a little bit of water and give it a whirl to chop them. Use them to fill ice cube trays. Once frozen, bag the cubes and you can use a cube of basil in sauces, soups, and marinades. Hope this helps. Super post! Lovely ravioli filling. And I really like the third picture (the oblique angle of the ravioli). Did you find a local source for “00″ flour or was it mail order? Interesting to hear of your experiences with the KitchenAid ravioli maker! I have one for my hand-cranked Atlas machine, and don’t like it at all. 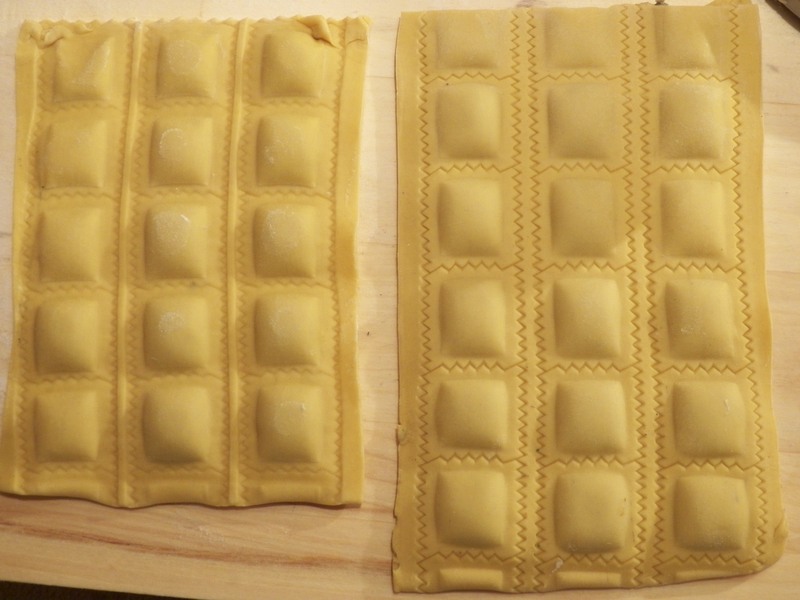 I bought one of the die/mold forms you recommended, and like it a lot – once you get the hang of it (not hard to do), it’s an easy way to make ravioli. I expect that’s what I’ll always use, unless I experiment with making ravioli out of a big, hand-rolled sheet of dough. Anyway, excellent recipe and post – thanks. Thanks, John. I, too, own the Atlas attachment and was equally disappointed with it. I bought the KA attachment thinking that it would be better, having watched YouTube videos of people happily making ravioli with it. I’ve given up trying to find something better or easier than the molds. As you mentioned, once you get the hang of it, it’s easy and quick. On “Ravioli Day”, I roll out the dough sheets on my KA pasta rollers and Zia works the dies. We can make quite a few ravioli in an afternoon, stocking her freezer for when family comes calling. I forgot. I bought the 00 flour from the Italian market here, though now I’m looking for it in every market I enter. It has to be available elsewhere. Thanks – although mail order is more convenient, I know it’s in a lot of Italian markets here in St. Louis, too. Gives me a good excuse to visit them (and buy lots and lots of stuff!). Those ingredients look fantastic. For some reason green asparagus is as rare as hens’ teeth here – I don’t know why, but I think the locals are very keen on white asparagus which I thought was a taste confined to more Eastern parts of Europe. I’ll just have to look at your picture. White asparagus is available here, Roger, though it’s not to common. I only saw 1 vendor with it at the farmers market — and he had none this morning. I did see quite a bit more purple this year, for some reason. One vendor called them “exotic”. How sad. Mmmmm your giant pillows of deliciousness have left my mouth watering, John. Thanks, Marianne. I foolishly thought that crimini mushrooms were known everywhere. Here they’re also known as baby portobello or baby bellas. I prefer them over button or white mushrooms because they’ve a bit more flavor. Gorgeous, as promised. You never fail to entice and delight with your magical cookery, John!! You never cease to amaze me with your creative combinations for fillings. These look absolutely mouth watering. I have a farm near me that sells duck eggs but have never tried them myself. It’s not that I’m particularly interesting in the taste so much as the fact that they are bigger & I’d like to use them for my eggshells Christmas decorations. Delicious and what perfect ravioli! Ravioli are usually my pasta of choice at a restaurant, unless they have gnocchi that is. I prefer the vegetable filled ravioli and I know I would pick this one for sure! This is gorgeous John, lovely flavours. All my favourites in one delicious bite. 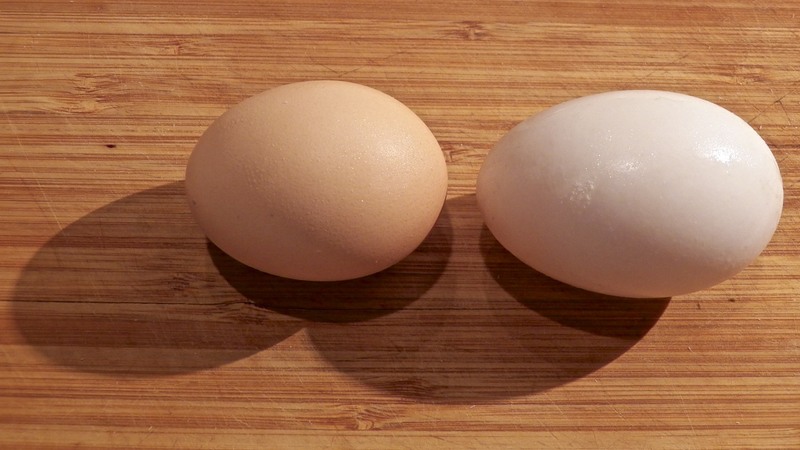 I’ve often wonderd about duck eggs because I can get them at my Asian market here but seeing that you didn’t notice a difference I’ll just stick to the regular ones. And I have to say, for not being a baker, you sure have a lot of flours in your pantry 🙂 How about a dessert recipe? Thanks, Nazneen. Just to be clear, I said that I couldn’t notice a difference in my pasta dough’s taste, though more yellow. Some commenters have said duck eggs make better cakes but I’ve no experience with them in that regard. I forgot! The durum and 00 flours are for pasta, the rest are for bread recipes. I’m not much of a baker, though. Dessert recipes here are few and far between. Lovely looking recipe John! Apparently, duck eggs are fantastic in cakes and the whites make amazing meringue. Haven’t tried them myself but I’ve been looking out for them. Thanks, Eleni, for the compliment and duck egg info. I bake cakes so rarely that I’ll have to take your word that duck eggs perform so well. As it is, I doubt I’ll buy more for making pasta. There just wasn’t a big enough difference to warrant the higher price. This filling recipe looks scrumptious. I have never included asparagus in a ravioli filling so you definitely have me intrigued. Hope your trip was great and can’t wait for the ramp recipe as well. I love your recipes. Being on a weight loss journey that will take a bit of time, I’m on a personal mission to adapt the recipes I love to lower calories without losing most the flavor. Losing weight can be delicious! Thank you very much. I wish you luck in your journey. Thank you for visiting and taking the time to comment. That’s very sweet of you, thanks very much. Congrats on finding the Tipo 00 flour. Makes all the difference! Thanks and you’re right. The more I use double 0, the better I like it. I went to that vendor this morning and half of those strawberries are gone and have been replaced by blueberries and raspberries. I’ve not made strawberry jam yet because I know once I get started, I get addicted to the stuff. I’m holding off as long as I can. 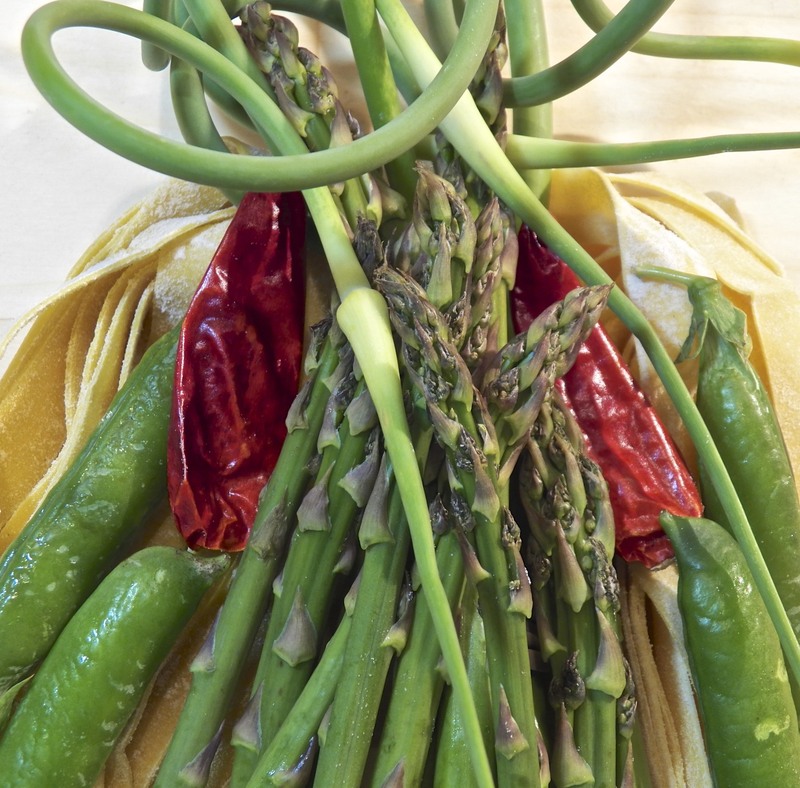 What a great summer time meal John every ingredient chosen just screams fresh flavours; my preference is to have the ravioli with the asparagus spears, some EVOO and lemon zest, my mouth was watering as I read this option. I was surprised to read that the duck eggs had no impact on the dish, I would have expected them to add richness—it’s a little disappointing. I’m looking forward to seeing what you shall do with the garlic scapes. And the berries, we have yet to see local berries yet. Thank you so much, Laura. Sorry to say that this isn’t a family recipe. It’s one that I created, having seen so many asparagus at the market each Spring. Like you, I can’t get enough asparagus and using them to stuff ravioli was a natural progression. If you do make them, I hope you like them as much as we do. If you created it then it’s just a newer ‘family recipe’ John! 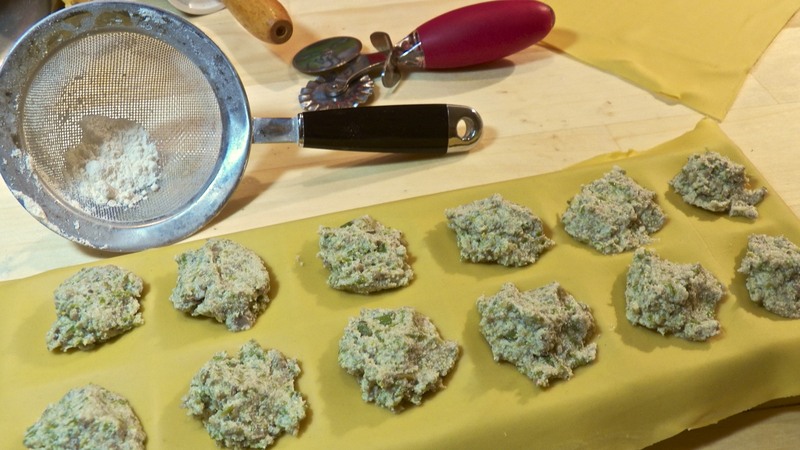 It’s nice to think that this recipe may be made by future generations of the Bartolini family! And possibly mine… as I can’t wait to try it myself! Drooooooooooooool!!! John, I could use that filling just for anything that I can think of, and just not ravioli. This is what I call superstar combination. The pictures look incredibly perfect too. Oh John! Those little pillows of loveliness are just WOW! Your photographs are outstanding! This is a true winner recipe!! I too have been using asparagus lately. I have to tell you this… I went to a funeral this past Saturday and had the honour of meeting a lovely follower of my blog. She asked me if Chicago John was related to me! I replied that we were not related. From our “conversations”, you and I, she got the impression that we were related! Small world, no? Thanks, Lidia, and I’m sorry to read of your loss. I wanted to sign up for the sour cherries offered at the farm and coming in soon but not being in my own kitchen makes it hard to make jam. Your ravioli filling is delicious, I know. And the duck eggs are interesting. Eggs are just perfect. Thanks for all your nice comments on the blogs. Summer is grand! Summer is grand, Ruth, but fleeting! Already the asparagus are gone and the strawberries have another week or two. Blueberries have arrived, as have raspberries. We’re watching time pass in fruit and berries. I’ve got my first sour cherries of the season and they’ll be going into a pie. Next batch will go into jam. Love them! Thank you, Ruth, for being such an great supporter. You never miss a post and I do appreciate the kind words that you leave. Man oh man, John. This is love on a plate. And sage butter sauce? My mouth waters at the thought. I agree, Abbe, and thank you. This ravioli can stand up to a number of sauces. The asparagus flavoring isn’t about to be overpowered. Yay! Thank you for your review about the kitchen aid attachment. I have been wondering whether to buy it. I will keep in mind your opinion. Thank you, Francesca, You could easily leave out the mushrooms and still have a wonderful filling. I hope you do try it and enjoy it. The KA attachment was a disappointment but I think that depends upon how one likes their ravioli. My family always used thin pasta sheets, say a setting of 6 or 7 on a pasta machine. To get good results with the KA, you need to go no thinner than a setting of 4, although I experimented and went to a 5 setting. The resulting ravioli were too “doughy” for my tastes. Thank you so much, Debra. You’ll find that there’s a strong flavor of asparagus in this filling and it can stand up to just about any sauce you use. I wish I could be more positive about the KA ravioli attachment but I was spoiled on raviolo made with thinner sheets of pasta. It’s why I don’t buy store-bought or order ravioli in restaurants. I told you. Spoiled! Before you decide to buy the KA attachment, search YouTube for videos of it in action. You’ll have a better dea of what it is all about. For Zia and me, we’ll stick with the dies. Your ravioli look so perfect and I love how yellow they are from the fresh duck eggs. I’m definitely on board with the browned butter and sage dressing, served with additional sauteed asparagus spears… sounds enchanting. I guess I’m lucky that we just happen to be in asparagus season here in Germany! Just stunning. Adore mushrooms & this looks like a delightful way to have them. Love Ravioli but now I love it more with your delicious recipe. Mushroom with asparagus….a taste of heaven! Thanks, Bud. It is a good combination and a great way to take advantage of the season’s asparagus harvest. Thanks, Stefan. It is a matter of personal preference, to be sure, but I just don’t care for thick-walled ravioli. They take too long to cook and taste chewy. To be honest, I was pleasantly surprised at how much better the dough was when ’00” flour was used. It really does have a better texture. In India, we don’t see ravioli makers so easily: we have to really search for these in specialised shops. But, we get these online here. I haven’t worked on pasta dough yet, so I noted down your observations. Really great! And the filling looks so tasty, John! I love anything with mushrooms! Sadly our asparagus season is just about over, but this looks a great recipe to try next year! I wish I could get doppio 0 flour here – sometimes I’m lucky enough to find it, but it’s rare. We have to make do with what we can find! What a great array of colors and a great filling. Thanks, Greg. It’s my first time using duck eggs and they really did brighten the pasta dough. This sounds like a perfect ravioli filling. … Actually, ALL your ravioli fillings sound perfect. Thanks for the tip re: draining the cheese in a coffee filter. Brilliant! Thank you for your kind words. I find cheese cloth to be vastly over-rated for this type of use. A coffee filter works perfectly. No matter what you use, the important thing is to have as little liquid in the filling as possible. Love seeing all those strawberries 🙂 In Minnesota, ours are late so it’s good to see your bounty as I know it’ll come our way eventually. Your ravioli are so pretty and what fun to see the “technology” behind it. Thank you, Liz, I’m glad you enjoyed the post. I was at the market this morning and already the strawberries are starting to disappear, being replaced by blueberries, raspberries, and even tomatoes, already. Summer is here no matter what the weather says. Thanks, Liz, for making a point to visit each week. I do appreciate it. Your ravioli really shows what a perfectionist you are – it’s just perfect! Love the filling of asparagus and mushroom. I know that combination makes a great quiche so I can definitely imagine how good it is in this ravioli. Sorry your ravioli attachment doesn’t work for you, but it certainly doesn’t seem to matter. You do a much better job without it. As always, a fabulous recipe. I always end up with frozen asparagus at the end of the season (I over buy since I love the stuff). I don’t see any reason why I couldn’t save that for this recipe do you? Usually I make soup out of it…. Thank you for the nice compliment. I see of no reason why frozen asparagus could not be used. In fact, I wish i’d thought of that this morning before I went to the market. I would have bought double the amount of asparagus I did buy. Thanks for the tip. 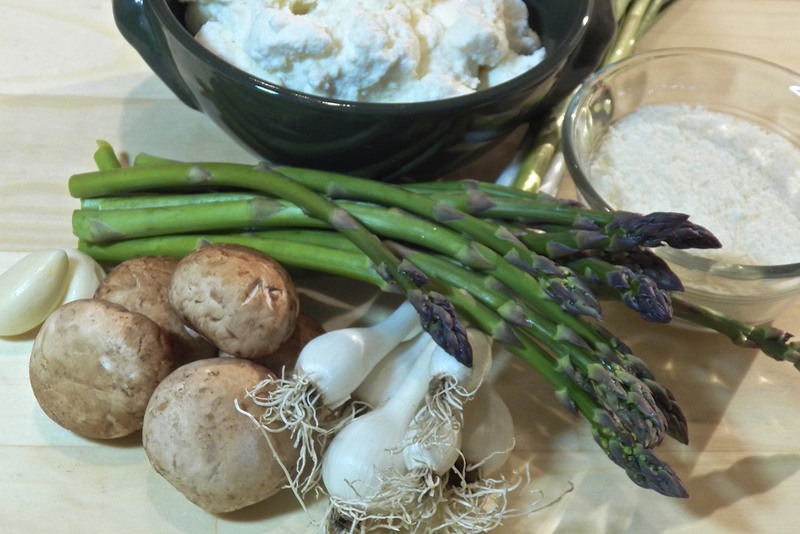 What a wonderful asparagus and mushroom filling recipe, John! And seeing the photos of the ravioli in the making is just great. As always, thank you for sharing and have a great weekend! Thanks, Stefano, for the compliments and support. I do appreciate you kindness. What perfect, plump little pillows! Great to to drain the ricotta first, thanks. I grow my own asparagus and it obligingly produces sporadically over a couple of months so I don’t drown in excess…. Now if I could only train my courgettes to do the same…. I forgot about those rows of strawberries. 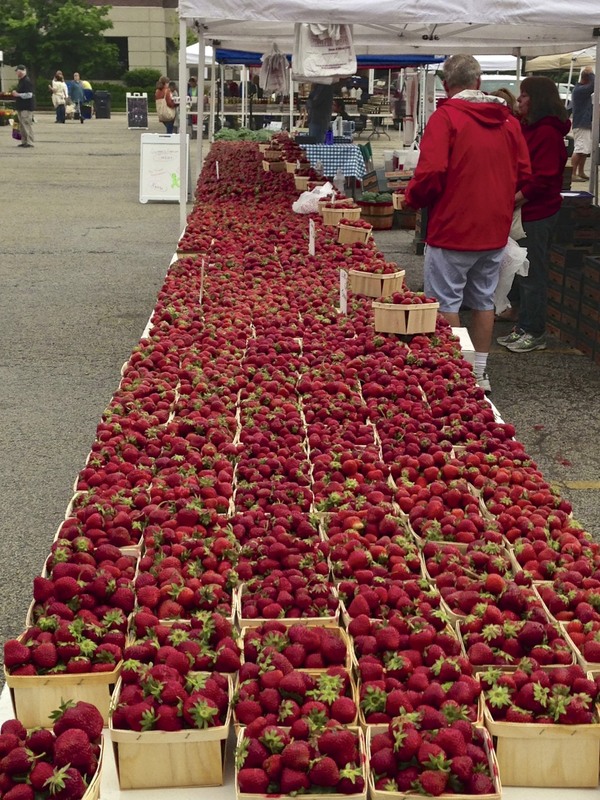 We really should get over to the Evanston farmer’s market one of these days. We usually hit one much, much farther away (Geneva) which is nice, but nothing like that table of strawberries. And you know I love your ravioli. I could sit and stare at them all day long. They make me happy. Now I just need to make them! I still haven’t gotten my ravioli molds yet and I still intend to. Life just seems to pass by so quickly (I do sure enjoy all our busy-ness though.). Mike would just love this filling too. He LOVES asparagus. The rest of us feel “ok” about asparagus, although when combined with mushrooms and cheese and in a ravioli, I’m totally game! Thank you, Kristy. I was at the market this morning and half of that table is now filled with blueberries, raspberries, and a little broccoli. Summer is flying by, even if the weather thinks it’s still May. I just love your pasta recipes.. and can’t believe there’s a ravioli attachment for your Kitchen Aid? 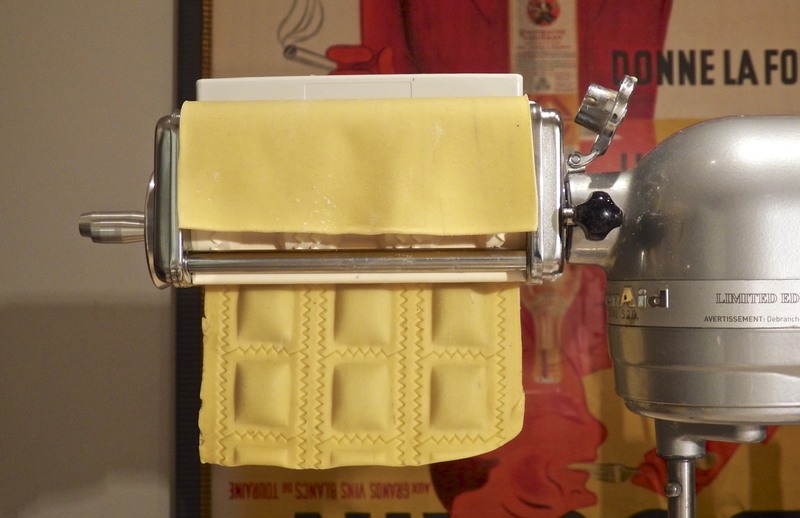 It took me about 10 years to try my pasta attachment, so I don’t think I’ll be buying a ravioli one any time soon, lol! I think I’ll stick with the rustic, hand-made look like your gnocchi (which I am still planning to try one day). 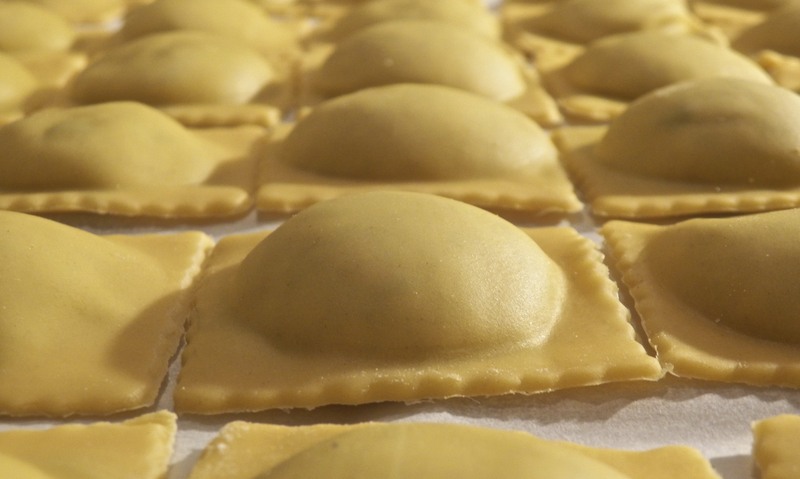 And since I love the look of ravioli molds, they could make it into a few food photography shots if I pick some up. On the other hand, to have a dish of your asparagus ravioli just handed to me with a fork… that would be heavenly! Have a wonderful weekend! Your ravioli look beautiful. I get a few beautiful ones (to photograph) but the rest are a bit second best. 🙂 I’m with you on the automatic thingo. 6 types of flour 😉 you make me laugh John! Your ravioli looks amazing! I have the same problem as you. Lots of different flours and also lots of different sorts of sugars. The 00 flour definitely turns out better, I cant believe the amount of strawberries in that market! This filling looks amazing John and is making me so hungry for pasta! In fact, just before our little disaster here I acquired a pasta machine and hope to get to use it in the not too distant future. For now I shall have to add this page to my bookmarks and pins. 🙂 Envy you your strawberry season. Enjoy! Nothing bad going on here my friend, though I had never thought to stuff ravs with greeny spears. Good stuff in my opinion. The Glutton household is a big supporter of the double OO flour and it is always in stock. We were lucky in Salt Lake City to have a great local Italian store that sold just about everything one needs. The double OO is running low which reminds me we have to find a new source in the DC area (though I can’t imagine it will be an issue). btw, great imagery on the post. John, these look wonderful. If you ever do I class on how to make homemade pasta I will definitely grab my apron and show up. 🙂 I made some before we moved with the won ton wrappers which we really enjoyed. The filling was an odd mixture of andouille sausage, mushrooms, chopped parsley, ricotta cheese and Parmesan, which peculiarly enough was absolutely yummy. I’m sure these would put them to shame, however. I have one Italian girlfriend who is always promising to include me in a day of real Italian cooking, but we live a good distance apart so doubt if this is happening any time soon. I bought a ravioli maker at a garage sale a few years back. The lovely older Italian woman who sold it to me made me promise I would take good care of it and use it often. I’ve kept half of my promise… it is in the exact same condition as the day I bought it! However, I’ve yet to work up the courage to actually use it! However, a recipe such as this might change things! The ravioli filling looks amazing! Thanks, Amber. If you’re own a ravioli dye/mold, similar to the one I used in this post, it’s not nearly as difficult to use as one might think. Like anything else, it will take a few iterations before you get your stride. I posted step-by-step instructions for using a mold and you can view them by clicking HERE. Good luck when you decide to give it a go and I’ll be here to answer any questions you may have. Not one to eat asparagus, your recipe makes me want to give it a try. Thanks for sharing. Thanks for the visit and I hope you have a wonderful 4th of July. You really must publish a book and consolidate many of these wonderful recipes, family history and Italian heritage. That’s a wonderful compliment, Kat. Thank you so much. what a decadent & delish meal. So impressive. You did absolutely a great job with this ravioli recipe. And the flavours are delicious. I can’t wait to try it myself. You are the winner. thanks a lot. Thanks for stopping by and taking the time to leave the kind words.